I'll be teaching a GTB course in Las Vegas on October 19 and 20. Students will receive a copy of the Golden Touch Blackjack Revolution book with CD (retail $24.95) and the Golden Touch Blackjack DVD (retail price $129.95). Plan now to attend the two day hands-on course that will teach you how to become an advantage player at blackjack. For details on this special course, visit www.goldentouchblackjack.com/signup.shtml or call 1-888-353-3234. This month's issue of the BJI begins with an interesting story from Vinny DeCarlo on how casinos opened the door for card markers when they decided to use less expensive playing cards. 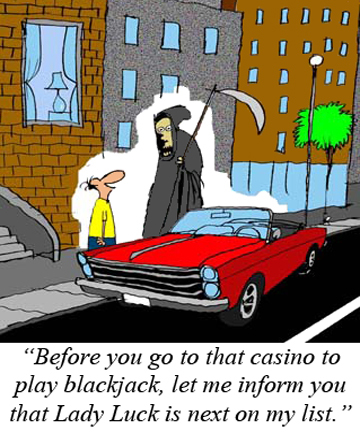 Eliot Jacobson's article analyzes the popular 21+3 blackjack side bet to determine if it could be beaten with card counting. A reader's question prompted Dan Pronovost to analyze a run count system using the High Low counting method (with interesting results). 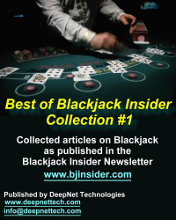 If you want to really understand pair splitting strategies in blackjack, read my article in this issue. We have detailed trip reports for casinos in Tunica, Biloxi, and Gulfport (by Riverboat Flyer), and another on several Indian casinos located in Arizona and California (by KC Brooks). Frank Scoblete wrote a nice tribute on two recent gambling writers who passed away, Bill Burton and Walter Thomason, and his team of reporters provide the current playing conditions (good and bad) in Atlantic City. John Grochowski does his usual excellent job answering player's questions on whether casinos can catch card counters in real time, the infamous Joker Wild video poker game offered in AC, and pit bosses harassing dice controllers. If you are a video poker player (or want to learn how to become one), don't miss reading Jerry "Stickmans" article that provides valuable playing strategies for full-pay, short-pay, and progressive Jacks or Better games. Last, but not least, we have a listing of upcoming blackjack tournaments, courtesy of blackjacktournaments.com. 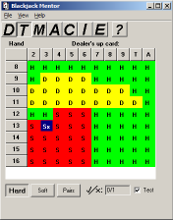 This excellent article, which appeared in issue #92, summarizes the best and simplest card counting systems for casual players. Click here to read the article. E-mail subscribers can also read each month's issue online at our web site: BJI Issue #164, Sept. 2013. "This true story is about how casinos decided to save pennies per pack on playing cards while unknowingly making it easier for "card markers" to beat them..."
CAN YOU BEAT THE 21+3 BLACKJACK SIDE BET by Eliot Jacobson, Ph.D.
"Read Eliot Jacobson's detailed analysis on whether it's possible to beat the 21+3 blackjack side bet..."
"Dan Pronovost analyzed a High Low variant run count system sent in by a reader with some interesting results..."
"Pair splitting in blackjack is a way for players to reduce the house edge against them. However, a playing option that was meant to help players often results in a moneymaker for the casino. The reason is that most players split pairs recklessly, or rely on hunches, with no thought towards proper strategy. But it doesn't have to be this way..."
"If you head north on Interstate 5 from Sacramento, CA, you will come to the town of Corning, home to Rolling Hills Casino. The Rolling Hills casino has over eight hundred slot machines, Pai Gow, Texas Shootout, Three-Card Poker, and blackjack..."
"It was time for another trip to Mississippi to try my luck at the casinos in Tunica, Biloxi, and Gulfport. Here's how it went..."
"The latest playing conditions in Atlantic City, and Frank's tribute to two friends and gaming writers that recently passed away..."
"John Grochowski answer's reader's questions dealing with the casino's spotting card counters in real time, the Joker Wild game in Atlantic City, and dice controllers being harassed by pit personnel..."
STICKMAN'S STANCE: STRATEGY CHANGES WHEN PLAYING SHORT-PAY JACKS OR BETTER GAMES by Jerry "Stickman"
"Gone are the golden days of video poker when you could readily find returns of 100+ percent. Those games are now virtually extinct. You can still find some full-pay Jacks or Better (9/6 - meaning 9-for-1 paid for a full house and 6-for-1 paid for a flush) that returns 99.54 percent with expert play. However, even these games are becoming harder and harder to locate. You are much more likely to come across short-pay version, such as 9/5, 8/6, 8/5, 7/5 and even 6/5..."